Big bet world was established in 2014 in Malta. It is operated by is operated by M-Hub Gaming Operations Ltd. The company is licensed in Malta by Malta Gaming Authority (MGA). That allows the company to perform activities such as betting. Because of the legislation under which the company operates it is a subject to the authority’s guidelines and monitoring activities. The registration number under which the company can be found is C63954. Big Bet World is a trading company operating in several different countries with accordance with the Maltese company and is regulated by Malta Financial Services Authority along with the MGA. The bookmaker is already well known among many bettors and has an extremely rapidly rising popularity in many countries. While the company is still very young they have a lot of interesting markets and odds. Gaining popularity while competing with some of the best names in the industry will be tough. But Big Bet World has what it takes to be a real contender for the top gambling spots. Offering great markets and competitive odds is the key to success. Let us see what the site is offering in terms of sports and other betting opportunities. With Big Bet World you can book on sports such as football, tennis, American football, baseball, Aussie rules, boxing, cricket, field hockey, pesapallo, rugby ,ice hockey, basketball, handball. You can also choose a variety of sports depending on a particular country. Online bets are possible thanks to their website or by using the app for Android and IPhone. Take advantage of live match view and live betting. There is a full-service coverage for every country, market, sports and bets. With a flexible platform allowing each player to create an individual account with unique visual identity allowing for faster and more accurate browsing and much more precise bet placing. 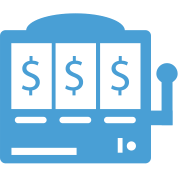 The platform allows for each customer to select favorite events for live bookies. The whole pack is available in several different languages – English, Serbian, German and Croatian and allows live betting to be more convenient, easy and simple. Big bet world offer several options to bet on – three way, which means there are three possible outcomes for the event; two-way bets – two possible outcomes, banker – which allows you to build your bet around a single outcome you really trust on. Of course, there is the option for handicap bets as well. The whole variety of handicap bets is 3-way handicap, 2-way handicap, level, whole point, half point and quarter point handicap. With the rise of the online bets and the increasing number of bookmakers online increases the amount of money in transfers around the web. That is why Big Bet World is well focused on security and uses latest technologies and approaches to guarantee the safety of each and every client. It is achieved through SSL encryption. By using that technology, each online bet is well secured. All of the information on the visitors and the users of the website is secured and well protected. Deposits can be made in many different ways according to currency and the amount of money each customer would like to deposit. Wire transfers – Direct Bank to bank transaction –can take 2 to 5 business days as international transfers may take even more than that. When it comes to deposits, the same day the money for the deposit arrive in the bank account of the bookmaker the account of the client is updated. Regarding Withdrawal requests – it takes one business day for a withdraw to be made and around 2 to 5 business days for the money to arrive in the client’s bank account. When using gateway solutions deposits made by using, credit cards are instant. About withdraws each client can use “Other Withdrawals” which is an option in each clients accounts and can be found easy. In this case, the withdrawal takes not more than seven business days but only after the online bookmakers receives all the necessary information and documentation. 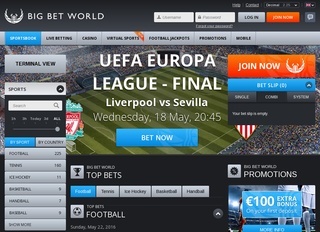 The online sports betting portal Big Bet World offers 100 Euro bonus for every new customer. Each client can claim the bonus right after the first deposit. It is super easy to do so: the client makes an account, makes the first deposit and claims the bonus. The rollover requirement is 3 times the (deposit plus bonus) amount on single bets of 2.0 or higher or on combination bets with combined odds of 2.0 or higher. 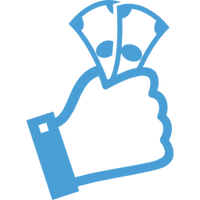 Superpay Bonus: The more selections each client combine, the more the online bookmaker boosts the winnings. With a 4-fold combination, there is an increase of 2% and an increase of 80% with the full 20-fold combination. Big Bet Points: this is a system where each client gains points during his/her betting. The more the customer bets, the more points he/she gathers. Each point can then be transferred into real money as 1 point equals 1 EUR. The Casino Bonus is 100% first deposit up to 200 EUR (deposit 100 EUR and get 100 EUR bonus). The amount should be wagered 35 times.